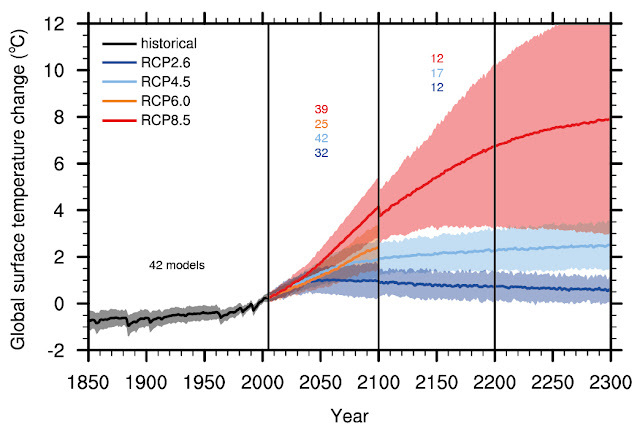 Reports of the International Panel of Climate Change (IPCC)⁽¹⁾, based on thousands of peer reviewed science papers and reports, offer a confident documentation of past and present processes in the atmosphere⁽²⁾, including future model projections (Figure 1). When it comes to estimates of future ice melt and sea level change rates, however, these models contain a number of significant departures from observations based on the paleoclimate evidence, from current observations and from likely future projections. This includes departures in terms of climate change feedbacks from land and water, ice melt rates, temperature trajectories, sea level rise rates, methane release rates, the role of fires, and observed onset of transient stadial (freeze) events⁽³⁾. Early stages of stadial event/s are manifest by the build-up of a large pool of cold water in the North Atlantic Ocean south of Greenland and along the fringes of the Antarctic continent (Figure 2). from CMIP5 (Coupled Model Inter-comparison Project) concentration-driven experiments. Linear to curved temperature trends portrayed by the IPCC to the year 2300 (Figure 1) are rare in the Pleistocene paleo-climate record, which abrupt include warming and cooling variations during both glacial (Dansgaard-Oeschger cycles; Ganopolski and Rahmstorf 2001⁽⁵⁾; Camille and Born, 2019⁽⁶⁾) and interglacial (Cortese et al. 2007⁽⁷⁾) periods. Hansen et al.’s (2016) model includes sharp drops in temperature, reflecting stadial freezing events in the Atlantic Ocean and the sub-Antarctic Ocean and their surrounds, reaching -2°C over several decades (Figure 5). around Antarctica, increasing with a 10-year doubling time, and half that amount around Greenland). 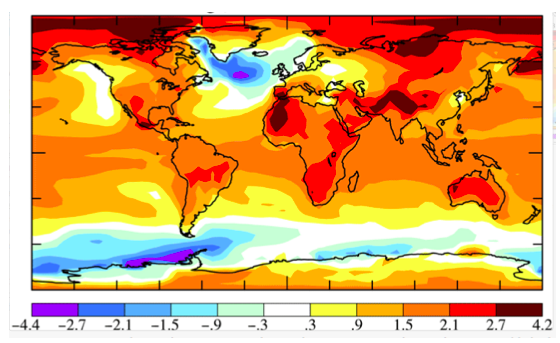 (b) SST (°C) in the North Atlantic region (44–60°N, 10–50°W). The development of large cold water pools south and east of Greenland (Rahmstorf et al. 2015⁽¹⁵⁾) and at the fringe of West Antarctica (Figures 1 and 5) signify early stages in the development of a stadial, consistent with the decline in the Atlantic Meridional Ocean Circulation (AMOC) (Figure 4). These projections differ markedly from linear model trends (Figure 1). 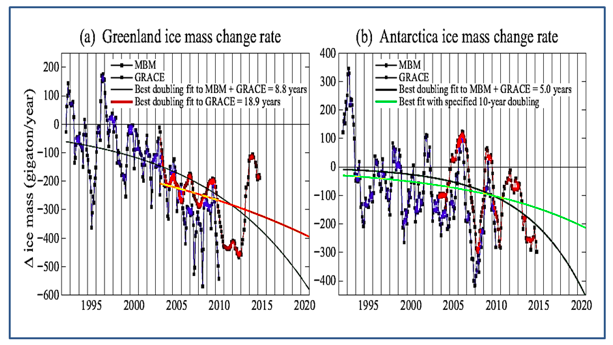 IPCC models mainly assume long term ice melt⁽¹⁶⁾, stating “For the 21st century, we expect that surface mass balance changes will dominate the volume response of both ice sheets (Greenland and Antarctica). A key question is whether ice-dynamical mechanisms could operate which would enhance ice discharge sufficiently to have an appreciable additional effect on sea level rise”⁽¹⁷⁾. The IPCC conclusion is difficult to reconcile with studies by Rignot et al. (2011) reporting that in 2006 the Greenland and Antarctic ice sheets experienced a “combined mass loss of 475 ± 158 Gt/yr, equivalent to 1.3 ± 0.4 mm/yr sea level rise”⁽¹⁸⁾. For the Antarctic ice sheet the IEMB team (2017) states the sheet lost 2,720 ± 1,390 billion tonnes of ice between 1992 and 2017, which corresponds to an increase in mean sea level of 7.6 ± 3.9 millimeter⁽¹⁹⁾. Climate model projections for the 21ᵗʰ to 23ʳᵈ centuries need to take paleoclimate evidence more fully into account, including the transient stadial effects of ice melt water flow into the oceans and amplifying feedbacks of global warming from land and oceans. Radiative forcing⁽²⁰], increasing with concentration of atmospheric greenhouse gases and rising by about 0.04 Watt/m²/year over the last 50 years⁽²¹⁾, totaled by more than 2 Watt/m², equivalent to ~3.0°C (~1.5°C per W/m²)⁽²²⁾. The rise of mean global temperatures to date by 0.9°C since 1880⁽²³⁾ therefore represents lag effect, pointing to potential temperature rise by approximately two degrees Celsius. 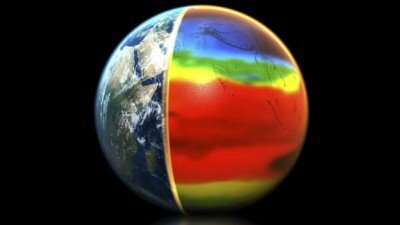 A further rise in global temperatures would be enhanced by amplifying feedbacks from land and oceans, including exposure of water surfaces following sea ice melting, reduction of CO₂ concentration in water, release of methane and fires. Climate change trajectories would be highly irregular as a result of stadial events affected by flow of ice melt water into the oceans. Whereas similar temperature fluctuations and stadial events occurred during past interglacial periods (Cortese et al. 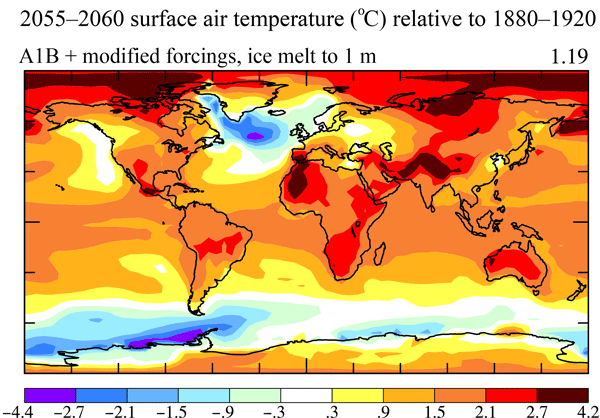 2007⁽²⁴⁾; Figure 6), when temperature fluctuations were close to ~1°C, further rises in temperature in future would enhance the intensity and frequency of extreme weather events, entering uncharted territory unlike any recorded during the Pleistocene, rendering large parts of the continents uninhabitable. Black lines – sea surface temperature. Marine isotope stage numbers are indicated on top of diagrams. 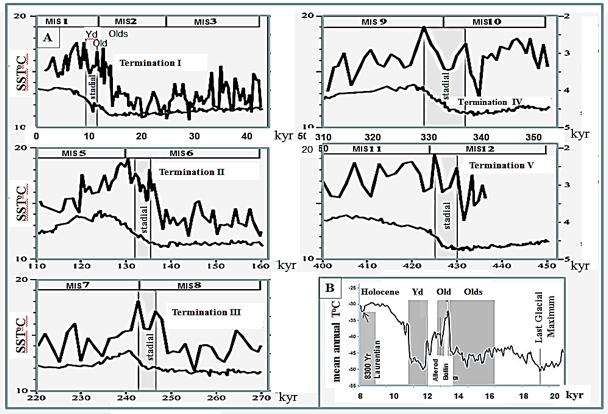 to the Younger Dryas preceding the onset of the Holocene (Cortese et al. 2007⁽²⁵⁾). (B) Mean temperatures for the late Pleistocene and early Holocene. Note to readers: please click the share buttons above. Forward this article to your email lists. Honorary Associate Professor, Geothermal Energy Centre of Excellence, University of Queensland.